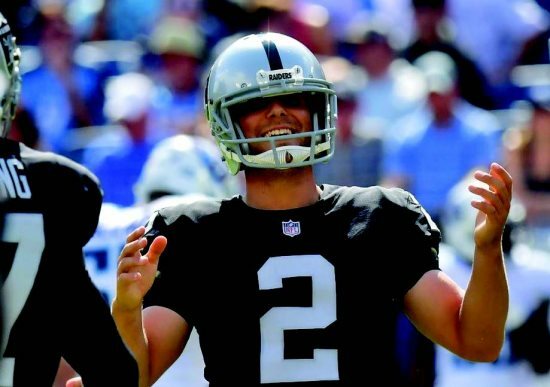 The Moraga Valley Presbyterian Church will be holding their Men's Dinner featuring guest speaker Giorgio Tavecchio, the placekicker for the Oakland Raiders, April 11 at the Saint Mary's Soda Center. Reception starts at 5:30 p.m. with dinner to follow. According to Bratton, "This is the first dinner open to the public and we are hoping in the future to hold them twice a year." 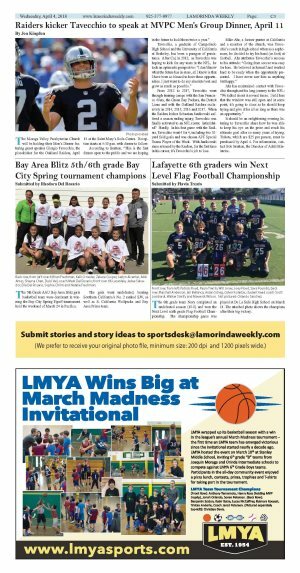 Tavecchio, a graduate of Campolindo High School and the University of California at Berkeley, has been a paragon of persistence. After Cal, in 2012, as Tavecchio was hoping to kick for any team in the NFL, he took an optimistic perspective: "I don't know what the future has in store, all I know is that I have been so blessed to have these opportunities. I just want to do my absolute best and grow as much as possible." From 2012 to 2017, Tavecchio went through training camps with the San Francisco 49ers, the Green Bay Packers, the Detroit Lions and with the Oakland Raiders exclusively in 2014, 2015, 2016 and 2017. When the Raiders kicker Sebastian Janikowski suffered a season ending injury, Tavecchio was finally activated to an NFL roster. Intimidated? Hardly. In his first game with the Raiders, Tavecchio went 4 for 4, including two 52-yard field goals and was chosen AFC Special Teams Player of the Week. With Janikowski since released by the Raiders, for the first time in his career, it's Tavecchio's job to lose. Mike Ahr, a former punter at California and a member of the church, was Tavecchio's coach in high school when as a sophomore, he decided to try his hand (or foot) at football. Ahr attributes Tavecchio's success to his attitude: "Going from soccer was easy for him. He believed in himself and worked hard to be ready when the opportunity presented. I have never saw him as anything but happy." Ahr has maintained contact with Tavecchio throughout his long journey to the NFL: "We talked about it several times. I told him that the window was still open and at some point, it's going to close so he should keep trying and give it his all as long as there was an opportunity." It should be an enlightening evening listening to Tavecchio share how he was able to keep his eye on the prize and reach his ultimate goal after so many years of trying. Tickets, which are $25 per person, must be purchased by April 4. For information, contact Bob Bratton, the Director of Adult Ministries.